Podcast » Podcast 54: Are You Leaving a Legacy? 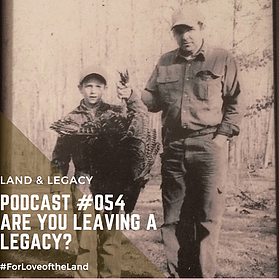 Podcast 54: Are You Leaving a Legacy? Have you ever asked the questioned, what happens if I were to just walk away from the property I manage? Let that sink in. What would be your lasting effect on the property? Would someone appreciate the work you've devoted time too? Would it make the impact that would continue to positively influence generations down the road? If not, you may consider changing practices or devoting more time to conserving the natural resources we as hunters and outdoorsmen have the priviledge to enjoy.